A 27 cm square cute cloth which fits into a hand. A coloured cloth which is neither a handkerchief nor a hand towel. There are about 200 different designs and new series come out each season. It can be a set with small supporting role stuff and can also be used for wrapping. The shape which can be formed by tying the cloth is free. Such MAMEGUI has a high presentation effect as a gift. The idea to make Tokyo as industrial culture climate, tradition and culture into gift is also superb. 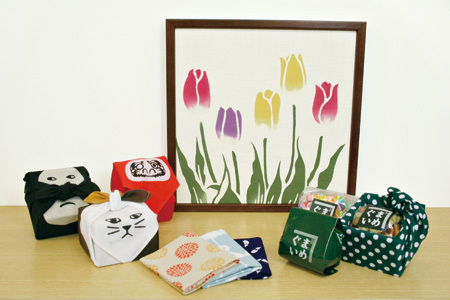 The patterns and design has a fresh sense and supported not only by men and women of all age but also from foreigners. It can be also seen as a evolution of Japanese culture. Furthermore, since it is produce with a technique called chyusen which is used from Meiji era and is also handmade, the colour and the patterns of each cloth are slightly different. Each time it is washed, the softness of the texture become softer. There is a 'fun' even when it is used. Full of fun spirits and fun to use. MAMEGUI is an excellent product which can produce a better life.